LA PAZ, Bolivia — Isaac Quispe sat on the sidewalk as people rushed by and scanned their feet to quickly assess their needs. “A shine, sir? I have tan polish,” the 11-year-old told one man. “I’ll work hard for you,” said the boy, who works to pay for school supplies. That such a young boy is toiling at a job is neither remarkable nor illegal in this South American country. Bolivia has the world’s lowest minimum age for child labor: 10. At that young age, children can work legally for themselves or their families. Once they hit age 12, they can work for others. The controversial law passed in 2014 is unique in the world, but three years later the government is still struggling with how to implement the regulation and protect children from abuse and exploitation. The United Nation’s International Labor Organization (ILO) and many other groups oppose the law, saying children under 14 should not work. An estimated 850,000 Bolivian children work, which is nearly 30% of children ages 5 to 17, according to UNICEF. The ILO has urged Bolivia to repeal the child labor law, but its supporters say children have the right to work. Young Isaac often toils into the night. Just past 10 p.m., after being ignored by a woman in brown boots, he finally found a customer. A man stopped and wouldn’t pay full price for a shine, but his shoes needed dusting off. Isaac cleaned the shoes and collected his pay: 14 cents. Isaac said he wears a mask to hide his face because people look down on the poor. He wants to work in a bank one day and doesn’t want people to know he shines shoes. Advocates who oppose letting children like Isaac work say some are exploited or sexually abused, while others wind up living on the streets, plagued with crime, violence and addiction. 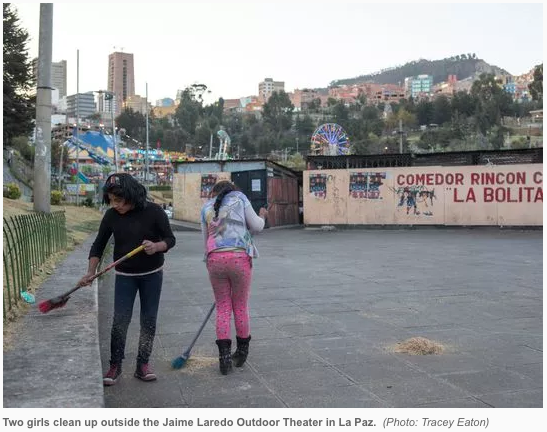 Legalizing child labor “was terrible, a mistake,” said Amparo Carvajal, president of the Permanent Assembly of Human Rights in La Paz, Bolivia’s capital. Supporters of the law say legalizing child labor empowers children. Plus, child workers helped write the law, sociologist Manfred Liebel said. 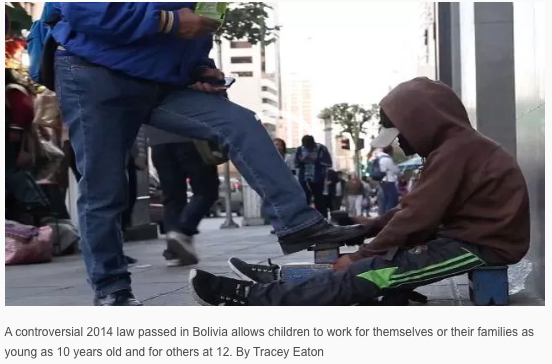 Bolivian lawmakers had planned to set the minimum working age at 14, but that idea led to riots as shoe shiners and other child workers — some as young as 10 — clashed with police in 2013. “The work of children and adolescents should not be eliminated, but we should not exploit or force them to work, either,” said Morales, who herded llamas at age 6 with his father. Simon Mamani continues such traditions on the high plains near Lake Titicaca. “We’re not afraid to work,” said Mamani, 46, whose three children help on the family’s dairy farm. “They started to work at 5 years of age.” Even with his children’s help, Mamani said he struggles to feed his cattle. Poverty and tradition lead many children to work. “Bolivia is protecting the rights of these boys, girls and adolescents as part of their cultural development,” said Hernan Rico, leader of the Delegation on Children and Adolescents in the government’s Ombudsman’s Office. Parents are required to sign permits allowing children to work. Strack estimates that no more than 10 permits have been issued in Cochabamba, where child workers in December complained about low wages. Most children earn $4 to $8 per day at the city’s sprawling La Cancha market. Vendors exploit some children, especially those ages 8 and 9, paying them $1.50 to $3 per day. Or they’re given only meals for their labor, said Sandra Caiguara, director of the Brother Manolo Center, a Christian group. Most children must work to support themselves and their families. 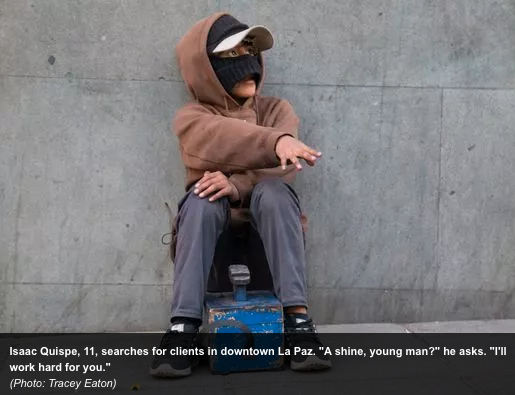 “I feel good about myself because I am helping my family,” said Jade Sanjinez, 14, an aspiring soccer player who has sold papers in La Paz since age 11. “We all work,” said the teenager, who has four brothers and sisters. Many Bolivians see it as “normal” for children to work at a young age, said sociologist Victor Paredes. He researched a community where a cement plant was built in 2015. He saw children and adolescents fetch bricks, wash clothes and sell turnovers. Some girls were abused. Others wound up pregnant after having relationships with adult construction workers. The government doesn’t investigate such cases, he said. “At the national level, they are totally unaware of the problems that different communities suffer,” Parades added. Some children work in “semi-slavery,” said Marcos Gandarillas, a Cochabamba sociologist who studies the mining and oil industries. “Globalization demands very cheap natural resources from Bolivia,” and child laborers are inexpensive and easy to replace, he said. Gandarillas said Americans should care, because many of Bolivia’s natural resources, including silver for jewelry, are exported to the United States. Journalist Jorge Fernandez worries about what happens to children after dark. This report was produced with support from the Pulitzer Center. This entry was posted in Bolivia, Business, Politics, Social Unrest and tagged children labor, demagogue, government failures, human rights, public policy failures. Bookmark the permalink.